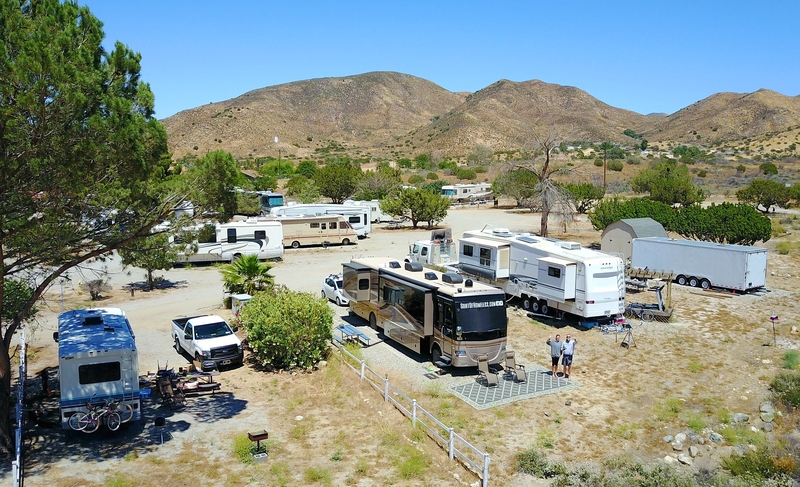 Coverage varies greatly depending on which section of the campground that you’re parked. The info we found indicated that section “N” had the best cell coverage, so that is where we stayed. Both Verizon and AT&T performed excellently at our site! In fact, I had a record high upload speed with Verizon at this site: 36.54 Mbps! Both services had 20+ Mbps download speeds with my setup (no booster). At the entrance of the campground, there is no useable coverage, so this shows how drastically it can change from one section to the next. 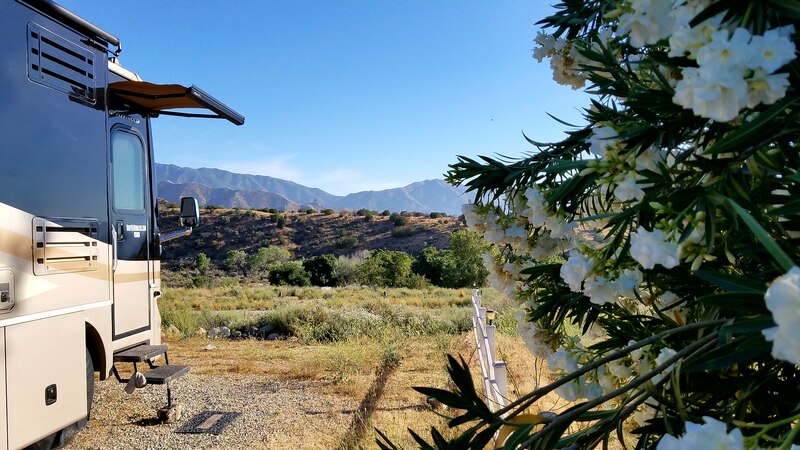 Notes about the surrounding area: Soledad Canyon is a valley between the Sierra Pelona and San Gabriel Mountains. Acton is roughly an hour drive (47 miles, “as the crow flies”) south to Los Angeles and 20 minutes to drive north to Palmdale, CA. 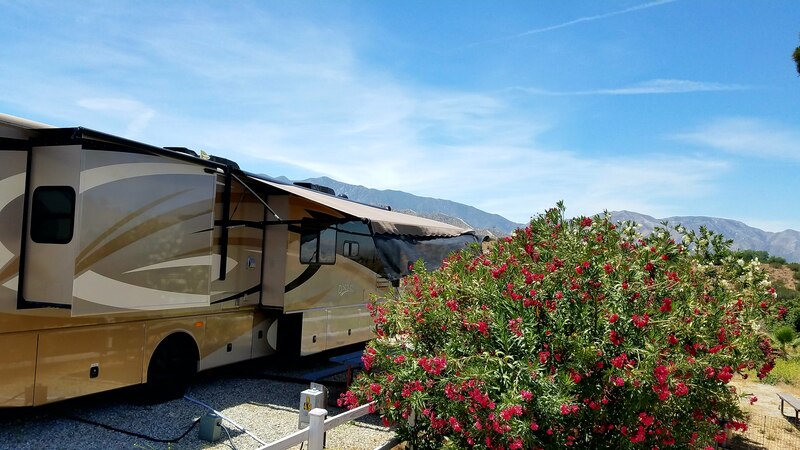 The area is referred to as “high desert” and the summer weather is typically warm and dry. While it can be quite dry, there is more greenery, versus other desert areas we’ve seen. Acton is a small town off of Highway-14 and has a population of just under 8,000. Much of the town has a “western” look that is a throwback to its founding as a mining town in the late 1800’s. Due to the old west theme and natural surroundings, there are many “movie ranches” and filming is a weekly, if not daily, event in the area (which can cause detours on the roads). For TV and movie buffs, it can be interesting to look up what has been filmed locally and see it in real life. During our stay, we’ve enjoyed locating some Sons of Anarchy filming locations. Fun tidbit: the sinking of the Titanic was filmed at a local movie ranch in a specially-built, man-made lake! Acton has an Ace hardware store, small grocery/general store, several local restaurants and a couple chain fast-food joints near the highway. We tried both local Mexican restaurants, La Cabana and Don Chato, and enjoyed both of them! The grocery store has all the necessities, but not much more. The closest town with everything you could want is Palmdale where they have Walmart, Best Buy, Target, Home Depot, etc. Being this close to LA, there isn’t much that you could desire that isn’t reachable within an hour drive. 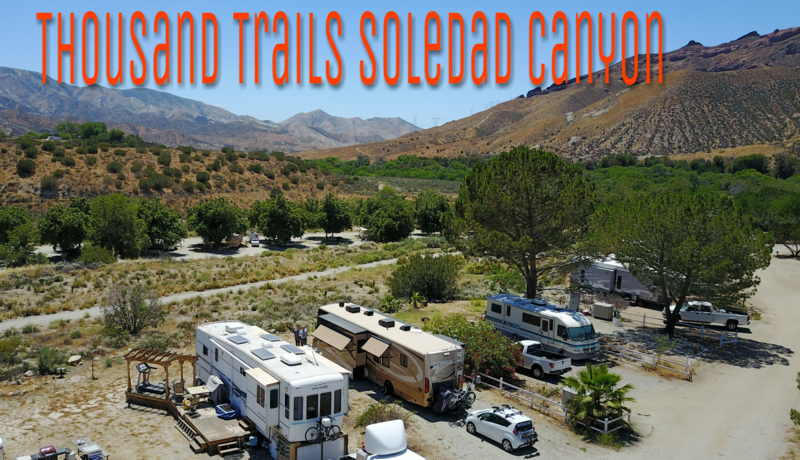 Particular notes about this campground and/or sites: At over 850 sites, Soledad Canyon is quite large! During the winter and holiday weekends, it definitely fills up. During our stay, it was busy, but not packed. Sites vary from fully exposed with unbelievable views to fully shaded next to a busy railroad. Most, if not all, sites are on dirt, gravel and/or sand. The majority of sites have sewer hookup, but 30 and 50 amp are intermingled throughout the park. We were told, and saw evidence of, new wiring being run throughout the park. This upgrade is supposed to make 50 amp much more prevalent. The park is broken up into eight sections (A,B,C,K,M,N,Q). As mentioned before, word is that N has the best cell reception and it was great for us, but it doesn’t offer many shaded sites. Sections A and B are very shady, but cell reception would be tough. Referenced earlier, there is a busy railroad that runs beside the campground. It is used by the Metrolink (LA mass transit) and freight trains. The sections most affected by the train noise would be A, B and K. There is a local Metrolink stop for those wanting to visit LA, but not drive. 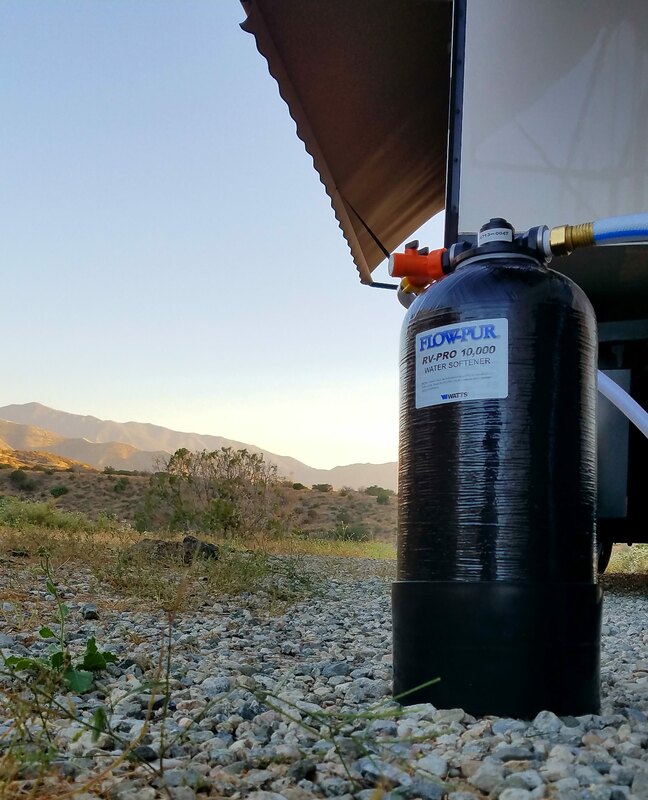 The water at this campground, and much of the southwest, is very hard. A water softener would be highly recommended for those staying awhile. This campground is very package-friendly! They do not add a surcharge and there are no restrictions on carriers. Like many campgrounds, they do not accept letter mail, only packages. Amenities: Amenities look to be in better-than-average condition, but we did not utilize any of them besides going into the adult lodge. Included are: shuffle board, horseshoes, tennis/pickleball courts, basketball, volleyball, mini golf, RV storage, adult pool and family pool. Wifi is available in the adult and family lodges for free, but it did not work reliably in our experience. Our experience: We’ve really been enjoying this landscape, which is foreign to both of us. This area is full of natural beauty and many sites offer great views. We were lucky enough to find a site in N that looked out over the canyon. Unfortunately, when I hooked up the electric, my Progressive EMS said there was an “open ground” (not grounded properly). I began to look for a different site, but couldn’t find one that offered anywhere near the same view. So, we called the office and they promptly sent out a maintenance crew member. Using a piece of rebar, they created a new ground just for our pedestal and we were in business! From the beginning, the staff has been great during our stay. All of the sites are designed to be backed-into. Since our site had such a nice view on the backside, I pulled Lucky in head-first and ran the utilities under the coach. No one has had any issue with this orientation and the view out the windshield is unreal! We took this opportunity to also visit LA (our first time) and caught a Dodgers’ game. When we come back in the future, there is much more that we’d like to see and explore! There is certainly no lack of entertainment and sight-seeing for those interested. The weather in this area is outstanding! Warm days, cool nights, low humidity – what more could you ask for?! We had days that didn’t break 70 and others close to 90, so it does vary, but all days have been dry and nice. It is my understanding that there is more rain during the winter, but it’s still pretty incredible. The weather can vary drastically depending on which part of the region you’re located. Watching the local weather report takes some adjustment as the viewing area’s forecast is broken up into about six areas depending on their elevation and proximity to the Pacific Ocean. As previously mentioned, the water is extremely hard here and this prompted the purchase of a new water softener. It has been great at bringing our water to normal mineral levels. SOH Score (1-10, 10 being the best campground imaginable): 7.5 – We’re suckers for great views and nice weather! This place had both! The site itself (minus the view), was nothing special, but that is quickly forgotten when you look out the windshield. The area is rural and rugged, but there is plenty to do and see nearby. Definitely recommend!